Well, most of last weekend was spent in the creation of Captain Jack Sparrow's vest and shirt. I am only semi-happy with the results. However, when I was pattern-shopping a couple of weeks ago, I found Simplicity Pattern 4923--a passable replication of Jack Sparrow's garb. With a few alterations, it would be perfect. And score! It was only $1.99! The vest turned out looking much more Will Turner than Captain Jack. I should have altered the neckline on the vest some. Also, if I remember correctly, the original film-used vest was unlined, but since the fabric I chose was fairly thin, I chose to line it anyway. I purchased all this fabric in Peace River, and our selection up there was pretty limited, so the colours are not 100% on, either. 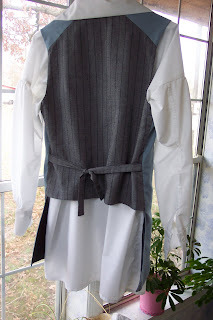 I substituted the dark blue front of the vest for a lighter blue, and the brown-striped back of the vest for a gray-striped. 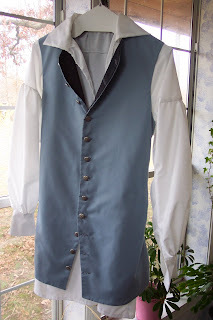 In other words, the waistcoat--while looking fairly 18th-century--does not look much like Jack Sparrow's. Sigh. For the shirt, I used the really amazing and authentic pattern found at Esoteric Creations. I find it laughable now that I thought that the pattern must be easy-peasy because it was created completely from squares and rectangles. Hah! Remember to add seam allowances over and above what the measurements given are. This only became a problem for me on the cuffs, fortunately. Even more fortunately, Jack Sparrow usually leaves one or both cuffs unbuttoned, so this time around, it is not a big deal. Some parts, like the neck gussets, are actually easier to apply with hand-sewing. Try not to sew later than your normal bedtime. The later you stay up after that, the more mistakes you are likely to make. Amanda - You make me laugh. :-D That's a good thing. In fact, every time I think about this, I chuckle again. Thanks! That's looking pretty spiffy there Talena! Love the buttons. I remember that sewing stuff...vaguely. I wish though, that we had digital cameras back when I was sewing for my lil fartheads. So many fun things they could have visual momentos of!